Welcome to the Docs for QClassify! QClassify is a Python framework for implementing variational quantum classifiers. The goal is to provide a generally customizable way of performing classification tasks using gate-model quantum devices. The quantum devices can be either simulated by a quantum simulator or a cloud-based quantum processor accessible via Rigetti Computing’s Quantum Cloud Services. 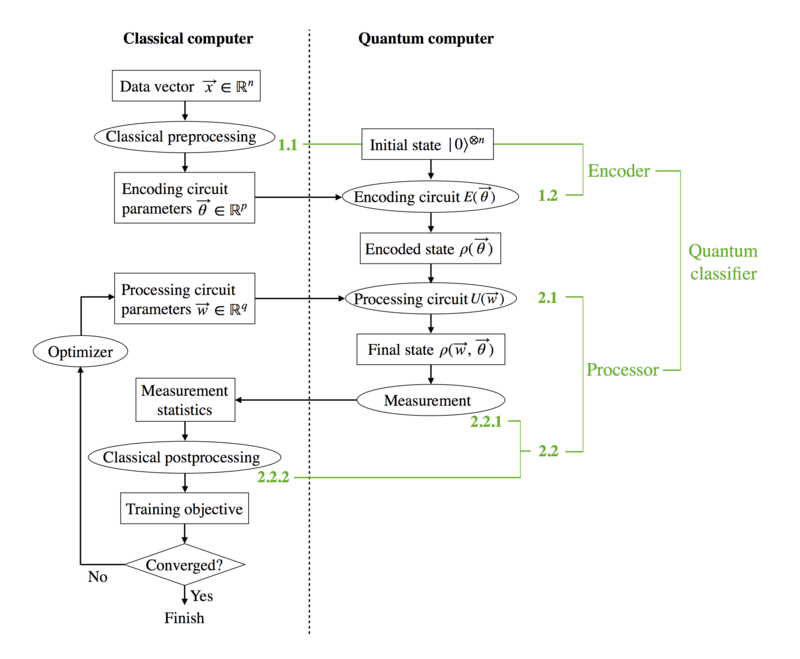 Variational quantum classification is a paradigm of supervised quantum machine learning that has been investigated actively in the quantum computing community (See for instance Farhi and Neven, Schuld et al., Mitarai et al. and Havlicek et al.). The general framework adopted in the design of QClassify follows from these contributions in the literature. Figure 1: Diagram illustrating the workflow of QClassify. Each rectangle represents a data object and each oval represents a method. © Copyright 2019, Yudong Cao, Sukin Sim Revision f1d8b803.